I enjoy photography and a bit of writing. I'm currently mid way through a 365 day photo challenge where I have to post a photo every day for a year - ridiculous challenge, but good fun and good learning experience. Take a 200 metre wander down the fire track and you've swapped a suburban street vista for a terrific waterfall in a natural bush setting. Who would have thought that nestled between Carlingford and North Rocks you would find such a terrific little oasis? Thankfully not too many, so let's keep it between us then. I've visited Balaka Falls in Hunts Creek Reserve a number of times. And each time it's been slightly different depending on the time of year (season), the amount of sun penetrating the canopy of the trees, and what the recent rainfall's been like. After a downpour, the water's really pumping down the rock face and the water's roaring. Access to the waterfall isn't difficult. Head to Norfolk Place in Carlingford and park on the street. There's a concrete path separating two of the houses at the end of the street. It joins up with the fire track which has good width and is a pretty even surface. A stroll along the track for about 200 metres will deliver you to the top of the waterfall. It's a little trickier getting down to the bottom of the fall, but if you take a bit of care it can be managed quickly and safely - it's only 10 metres or so with well-placed rocks to step down on. Walk along the fire track to get to the top of the falls. An open area at the foot of the falls provides plenty of viewing room. After a good solid downpour, there might be a few photography enthusiasts down there (including me) but there's plenty of space for everyone. 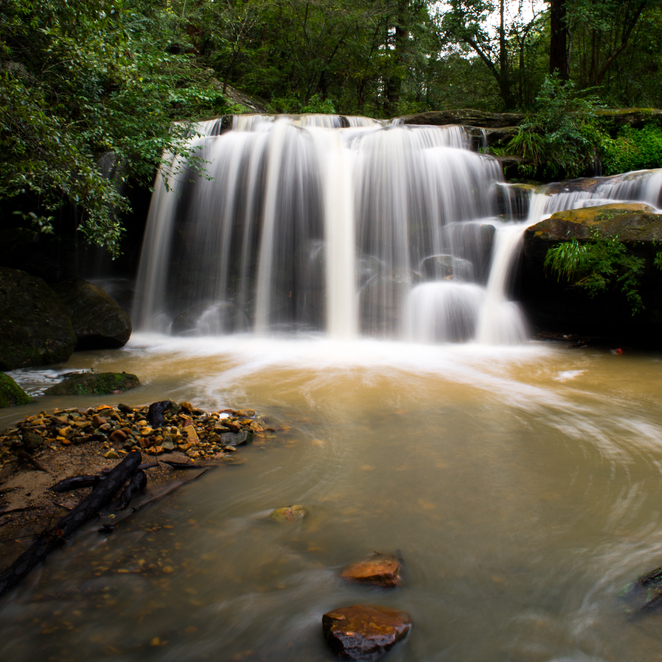 If you're keen on photography try a shutter speed of 1 to 3 seconds (depending on how quickly the water is flowing). A bit of trial and error with your camera settings should give the water a silkiness but still a bit of definition. There's more than enough space and quite level ground, so using a tripod is the way to go if you have one. 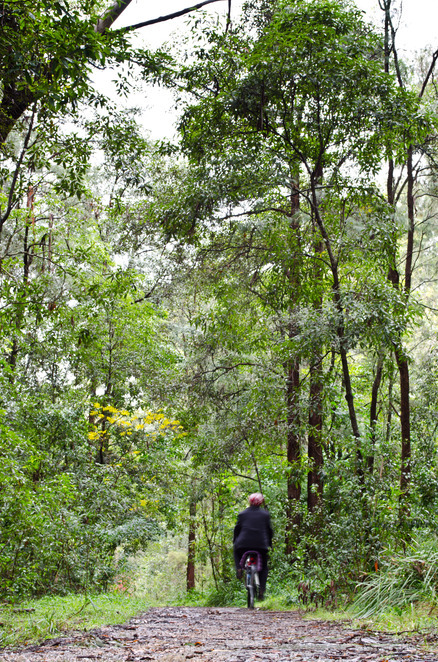 There are also small bushwalks around Hunts Creek that are known to be good for kids and not overly taxing. But I wouldn't know. I'm there to photograph the waterfall. It's Carlingford's hidden gem. We went there today. So pretty. Realised we looked at 3 houses in that street 5 yrs ago when we were looking to buy but had no idea it was there. Pretty. Lived in Sydney 8 years and don't know this spot! Wow, what a find and it's not far from me. Gonna have to check this out. Thanks for sharing.